The first generation of Wu's taichichuan started from Chuan Yuo (1832-1902), a Manchurian who learned taichichuan from Yang Lu-chan, a well-known martial arts master teaching in the Royal army of the Qing dynasty. Among Yang's students the following three were most studious and attained the essence of his skill: they were Wan Chun, Lin San and Chuan Yuo. It was said that each of them acquired a characteristic skill from their teacher, one energetic, one offensive, and the last neutralizing, and were compared to muscle, bone and skin respectively. As suggested by Yang, Chuan Yuo became the disciple of Yang's second son Yang Ban-hou, although Chuan Yuo was taught his skills by Yang Lu-chuan himself. 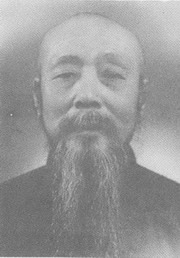 Master Wu Chian-chuan is the son of Chuan Yuo, his surname Wu was transliterated from the pronunciation of his Manchu name. He was disciplined in martial arts by his father when he was very young and took painstaking care to investigate martial arts while growing up. He was the founder of the Wu style taichichuan which is popular today. He was also good at horse-riding and shooting and could hide himself under the saddle of a horse or stand on his head on the back of a horse when it was running fast. In the early stage of the Republic of China, Xi Yui-seng (1879-1945), a follower of the Yang family, established the Athletic Research Institute in Peking and invited Yang Shoa-hoa (1862-1930), Yang Chen-fu (1883-1936) and Wu Chian-chuan to teach taichichuan in the institute. From then on taichichuan was taught to the public, thus opening up a new era that overthrew the ancient closed-door policy in which taichichuan was taught privately within a limited circle, which established the so called tutor-disciple relationship. During his long years of practicing and teaching, Master Wu Chian-chuan revised and enriched the art of taichichuan handed down from his family. In the traditional slow forms, he omitted some of the repetitions, jumping and stamping movements, so as to make the forms more smooth and structured, thus creating one of the main schools of taichichuan, the Wu style, which has been appreciated and enjoyed by vast numbers of students for many years. The fast form on the other hand kept the original jumping and attacking movements to be studied by those people eager for further study and practice. The forms of Wu style taichichuan are naturally structured and characterised by agility, smoothness and continuity. All movements conform to the theory of mutual promotion of yin and yang. Wu style tui-shou (pushing hands) requires strictly centred equilibrium of the body, stillness, subtlety and softness in practicing the interweaving variations. In tui-shou with moving steps and dalu (a special procedure of tui-shou with moving steps), alertness and "sticking" to each other are also outstanding characteristics. Lan Cai Hua is the name of a combat exercise reaching the acme of perfection; it is as mightly as the flow of a great river and has such a complex strategy that it can hardly be described in words. Besides these, the Wu style taichichuan has kept many types of weapons such as the double-edged sword, tai chi combating sword, tai chi broadsword, tai chi long spear, twenty four stratagems of tai chi spear, four "piercing" spears and the sticking sticks. In the year 1928, Master Wu Chian-chuan moved from Peking to teach taichichuan in Shanghai. The Shanghia Taichichuan Association was founded in 1935. In 1939, the members of the Association were given a fund to build the Chian Chuan Hall on the ninth floor of the YMCA building on Tibet Road in Shanghai, a convenient place for learners to practice and study. Meawhile overseas organizations of Wu style taichichuan were also established in Hong Kong, Macao, Singapore, Malaysia, Philippines, Canada and other countries. There are also Wu style taichichuan classes at the United Nations' Club. Master Wu Chian-chuan died in 1942. It was a great loss in the field of martial arts in China. The work of the Association in Shanghai is being continued by Ma Yueh-liang and Wu Ying-hua.